Chile's mint has sacked its managing director after he sent into circulation thousands of coins bearing an incorrect spelling of the country's name. 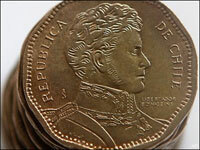 The 50-peso coins, worth around 10 US cents each, were issued in 2008 with Chile spelled "Chiie" -- an error that was only noticed late last year, Times of India reports. According to Daily Mail, the mint said it has no plans to take the coins out of circulation, and eagle-eyed Chileans have begun hoarding the coins in the hope they rise in value as a collector's item. Last October, a staff member sold a rare medal, which should have been housed in the institution's museum, to a coin collector. A month later, another medal - this one bearing the face of the country's then President Michelle Bachelet - was inadvertently sold on the open market. The Central Bank, which issues the coins, did not learn of the error until it was reported by the newspaper El Mercurio in December, the same month that Urzua was fired, the engraver said. The head of his department was fired in January. The press department at the mint said Friday that officials would not comment. No one could be reached at the Central Bank. The 50-peso piece is 2.5 centimeters across, just under an inch — making it difficult to immediately see on the faulty coins that Chile is spelled "Chiie." Urzua is suing the mint for denying him severance pay — based on what he says is the mint's false claim that he was doing work for other employers at his house, something forbidden in his contract, The Associated Press reports.